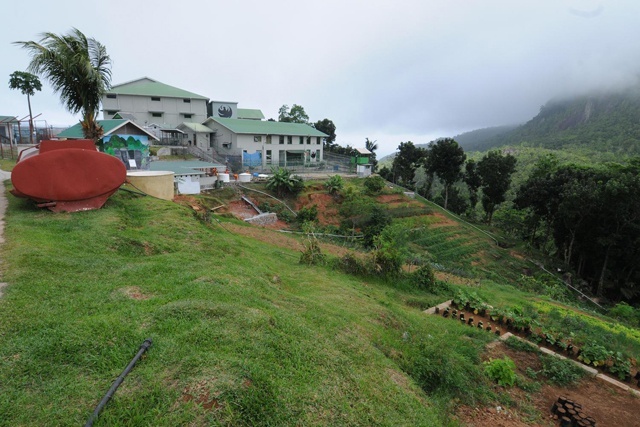 (Seychelles News Agency) - The Seychelles main prison of Montagne Posée which is located up the hills that lead to the Western part of the main island of Mahé is taking steps to reduce its carbon footprint, by bringing down its consumption of treated water and electricity. This is possible thanks to the "Green Prison Project" being implemented with the help of the Australian and British Governments, Sustainability for Seychelles (S4S), a Non-Governmental Organisation (NGO) that promote sustainable living as well as other local partners. Before leaving the Indian Ocean archipelago after a four-day official visit, six members of the Australian Parliament headed by Warren Entsch, MP for Leichhardt, Queensland, saw the progress made to complete the project. Prison Superintendent Maxime Tirant briefed the visitors who were accompanied by the Seychelles Minister for Home Affairs Joel Morgan also responsible for the island nations’ prisons and Australian High Commissioner Susan Coles on steps taken for harvesting rainwater, plans for organic growing of vegetables and fruits and the recycling of wastes into usable items. Tirant showed them fibre glass water tank being built by inmates, which will be used for watering the prison gardens. He remarked that the roofs of the prison buildings have an area of just over 4,000 square metres and that there is scope for expanding water harvesting. "The labour is provided by the inmates, most of whom have skills and talents and wish to put that to good use and rebuild their lives," said Tirant. He added that the Prison services together with Sustainability for Seychelles (S4S) have other upcoming projects including the installation of solar lights around the prison precincts, the replacement of existing light bulbs with LED lighting and the isolation of cold storage. Cold storage facilities, he noted constitute over 20 percent of the prison's electricity consumption. Mia Dunford, a board member of S4S told SNA that the NGO started working with the Prison in 2012, having been invited by another NGO, Friends of Prison to help them put together the "Green Prison project”. "We were inspired by this idea and since then have partnered with Friends of Prison and other NGOs to help the prison reduce its environmental impact and give the inmates more opportunities to learn skills related to recycling, sustainable agriculture and rational use of resources," said Dunford. She noted that S4S conducted energy and water audits to determine areas where improvements could be made and then worked with the prison to implement the necessary changes. Dunford told SNA that the project's total worth is over 800,000 Seychelles rupees or around $66,000, of which the Australian Government's contribution is $ 30,000. Other partners involved include the island nations’ Public Utilities Corporation (PUC) and the Seychelles Energy Commission. "And of course, there were the inmates who are building all this, their labour counts a lot. We appreciate their enthusiasm and dedication to making the prison a greener institution for the benefit of their environment," said Dunford. Apart from reducing its electricity consumption and that of treated water by relying more on rainwater harvesting Tirant also mentioned efforts to make the prison self-sufficient in terms of its daily consumption of fruits and vegetables. He noted that more cows will be introduced to produce manure to make the prison as self-sufficient as possible in vegetables, while more land is being cleared uphill to make way for an orchard. As at June 23 this year the prison population of the Indian Ocean island stood at 786 among which 727 are Seychellois nationals. Most of the prisoners 608 in total have already been convicted while 119 are on remand. The majority of the inmates are incarcerated in the main Montagne Posée Prison, some 500 of them. The remaining are either in the Open prison on Coetivy island, 290 kilometres south of the main island of Mahé, which is for the rehabilitation of prisoners or in the prison where drug traffickers, sexual offenders and refractory prisoners are incarcerated, on Marie-Louise, an outer island of the Seychelles. While visiting the prison to be updated on the Green Prison Project, the Australian parliamentarians were also taken on a tour of some of other ongoing rehabilitation projects. This include a gymnasium, a library, an IT room and a workshop. “The Phoenix Gym has been so named (….) just as the Phoenix rose from the ashes, the inmates here are serving time to come out better persons and lead new and productive lives," remarked Raymond St Ange, the Security Advisor to the Minister for Home Affairs and Transport. At the workshop, inmates transform wood, rope and other raw materials into jewellery, small boats, fishes and even furniture items. “Whatever success we achieve at Montagne Posée, will be replicated at Coetivy and Marie-Louise prisons," said St Ange. At the end of the visit the head of the Australian delegation Warren Entsch said “I applaud your efforts to harness this big pool of manpower for learning new skills, which will be put to good use when they are outside". During their four-day visit to Seychelles, the Australian MPs also visited the archipelago’s National Assembly and meet with some of their Seychellois counterparts. They also visited several other projects involving Australian funding, which also took them to the second most populated Seychelles island of Praslin Friday to visit Baie Ste Anne Farmers Cooperative (financed in conjunction with the United nations Development Programme) and the Lifesavers Association at Anse Lazio.